It is time to be accountable and declare what I accomplished with my December OMG (One Monthly Goal). Because of Christmas and the e-commerce explosion (I work at a post office), I kept my goal light…I really did not expect to accomplish much. I thought I just might have time to machine quilt half of The Case of the Secret Garden (a Linda Franz/Inklingo mystery from 2013). But I put my nose to the grindstone, and quilted at every opportunity that I could, and I am so happy to report a finish! If you click on the link above, you can find links to the beginning of this project, and each clue that I worked on it, as well as find where it originated on Linda Franz’ website, Inklingo. Some of the pictures aren’t that great (it is hard to take good pics indoors in the midst of winter), but they show that I finished this baby! By clicking on a photo, you can see it enlarged. This quilt was machine quilted on a domestic sewing machine. 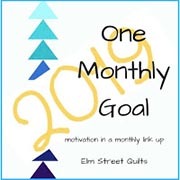 I am linking up with Elm Street Quilts for One Monthly Goal (OMG). Click on the link and see the other goals that were accomplished for December! Funny how what goes around comes around. For my December OMG, I decided to focus on a UFO called The Case of the Secret Garden. I dug through the blog to see when I last worked on this project. It appears it was also my goal for December OMG 2017. Hmmmmmm. If you click on the links above, you can find links to the beginning of this project, and each clue that I worked on it, as well as find where it originated on Linda Franz’ website, Inklingo. Linda began this enjoyable mystery in the year 2013. So, why did I wad this project up in a corner? Partly because I went through a tough time (why do I throw my creativity aside when I need it the most…another mystery), and partly because I changed my mind about my fabric choices. I like the fabric choices. I don’t like the fabric choices. I like the fabric choices. I can’t stand the fabric choices. Nothing like a little positive motivation! So this top is pin basted, and I am in the process of machine quilting it. I hope to complete the quilting, of course, but realistically, because it is December, and the busiest time of the year, my goal is to complete half of the machine quilting. I am linking up with Elm Street Quilts for One Monthly Goal (OMG). Click on the link and see the other goals for December! Maybe you would like to add a goal!